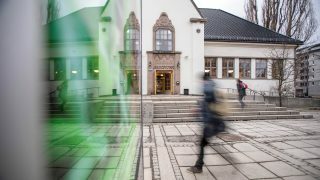 In Grünerløkka, Oslo’s trendiest district, lies Norway’s oldest library building. 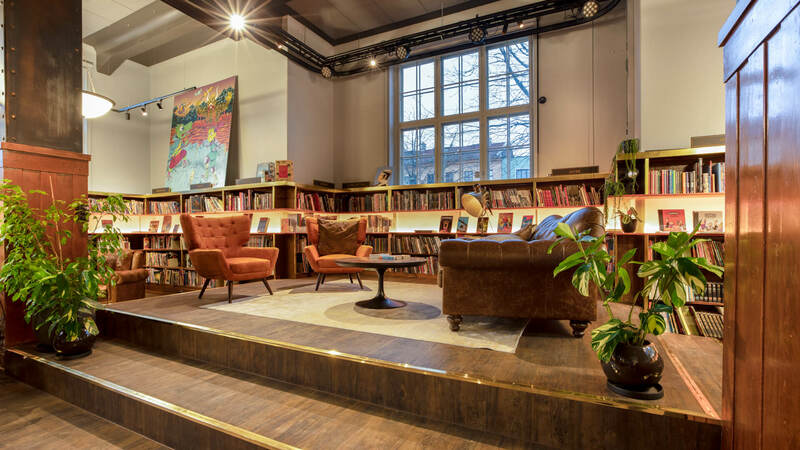 A recent complete renovation has turned this building into a new neighborhood hotspot: Deichman Grünerløkka Library. It’s a cultural hub to meet, exchange ideas, build, repair and grow… either by reading books or planting seeds. 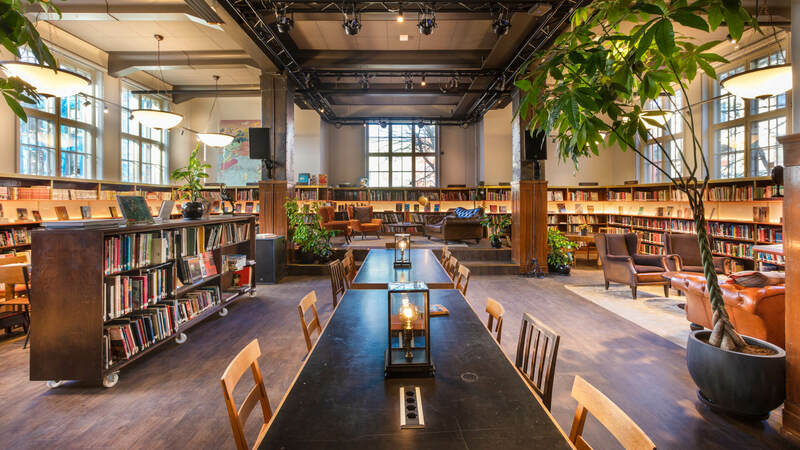 International creative guide & architect Aat Vos developed the concept and design of the renewed Grünerløkka library (800m2), a branch of Oslo Public Libraries, in co-creation with the stage builders of Artisan Tech AS (production and development). A new design was planned. However, original monumental elements of the building were to be maintained. The goal was a balance between the original and revised version; it was time to rethink tradition. 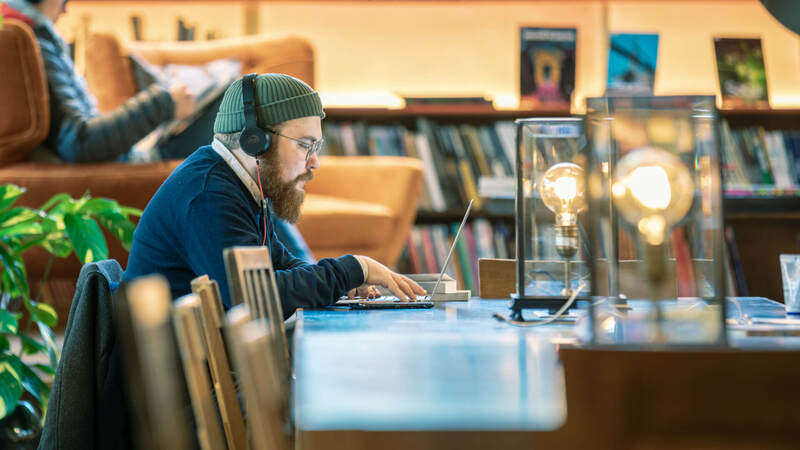 Aat Vos elaborates on this transformation, “The Grünerløkka library concept enables people to connect, discover, inspire, co-create and learn (from your grandpa). 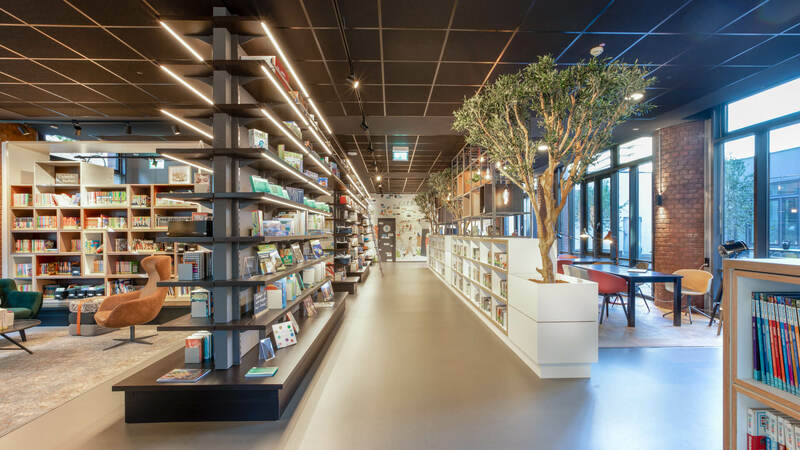 This renewed library functions as a toolbox for localism*. The task was to seamlessly implement universal access items (such as toilets and elevators for differently-abled persons) and also accommodate Norway’s largest collection of comics. Comfy, vintage furniture pieces are used to create cozy lounge corners. They are easy to move or remove, allowing a smooth transition from ‘work mode’ to ‘event mode’. 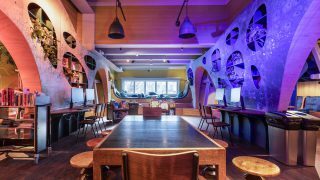 The interior contains numerous other elements for the library to be used as a multifunctional venue. 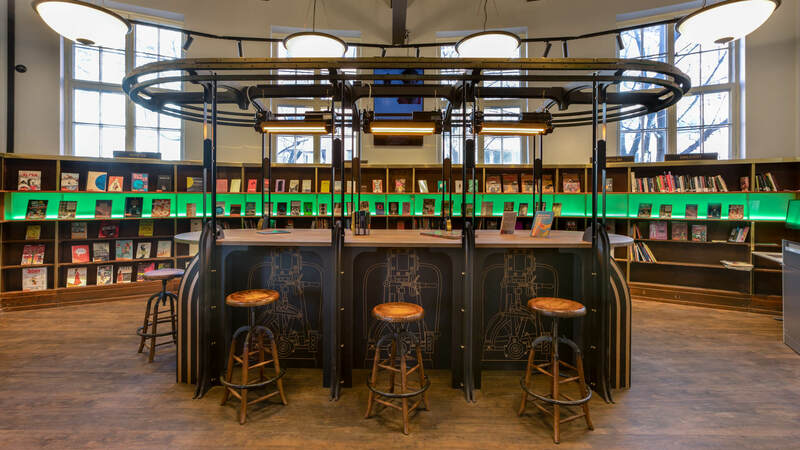 A massive information desk on the ground floor can be transformed into a bar. 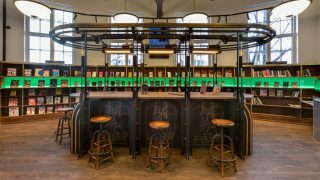 It references the art-deco period, fused with industrial and steam punk elements. Vintage ship lamps emphasize the industrial feel. The first floor holds a new colorful kids’ experience, a workshop and a stage area. The two eye-catching wall sections were designed to ‘flow’ into the room. This ‘wave construction’ can be used as a display or to store visitors’ belongings. It is covered with the artwork of artist Emma Lindström, which has a sense of organic cellular form. The kids’ area is all about imagination coupled with experience, like a one of a kind ‘interior of a Victorian sci-fi melting pot’. * = Deichman Grünerløkka is intended to be a toolbox for the community, in both a practical and a metaphorical sense. 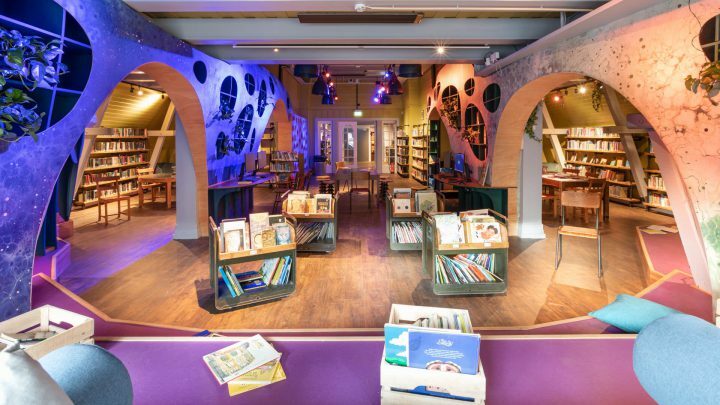 The library will not only allow people to borrow books and tools, it will also host workshops, repair parties, exchange market days, provide people with seeds to plant at home, and advise them on how to grow their own food. Deichman Grünerløkka will also focus on arranging events aimed at providing people with a better understanding of their society and how to act in order to influence it. 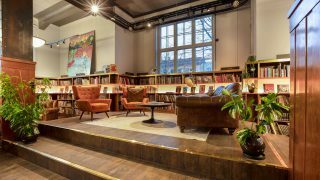 The shelves will display one of Oslo’s widest and most up-to-date selections of books on social issues.